A.S.E Certified High-tech Diagnostics and Repair for Engine Performance, Emissions Control, Electrical, Drive Train, Transmission, Steering, Suspension, Alignment, Tune-Ups, Brakes, Alternator, Radiator, Air Conditioning, Factory-Authorized Maintenance, and More! A.S.E. Certified Diagnostic Master Technicians and have spent over $250,000.00 on State-of-the-Art equipment. We encourage you to come down, meet the team and take look at our facility. You will see why we will be your 1st Choice in auto repair. See our SPECIALS Page for Coupons! 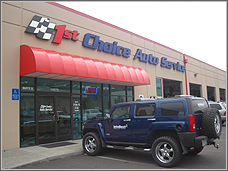 Both of our state-of-the-art facilities in Clackamas and Tigard provide you with honest, professional service and a complete explanation of services required for your vehicle. 1st Choice Auto Service is a repair facility that gives you honest, professional information to empower you to decide what repairs you want performed on your vehicle. Scheduling online is fast and very easy. Hours: M-F 8-6, Sat 8-4, Closed Sun.